It was a bittersweet race for me. I did get a PR but it was no where near my goal. My garmin says 4:26:06 (4:26:02 official). Regardless, I’m still happy. I know what to do differently next month in Winnipeg. 8:00 am – pretty calm winds, temp of 50 degrees. PERFECT. I started out with the 4 hour pacer. The beginning of the race was fantastic, but the pacer was going too fast. between 8:30 and 8:45 for most of the first 10K. In hindsight, this was my downfall. By around 9 miles I started to slow, he pulled ahead of me and I lost him. Winds were picking up too. I was still feeling ok and hit the half way point right on track at around 2 hours. Then I started to go downhill. I lost steam. I finally figured out that I was dehydrated. The winds were really drying me out. Even though I was drinking water at every station, I was not drinking enough. I started walking through the water stations and drinking 2 or 3 cups. I started feeling less light headed but I still just felt off. So I decided to modify my goal and shoot for 4:15. I was alternating walking and running through miles 15, 16, 17, 18. 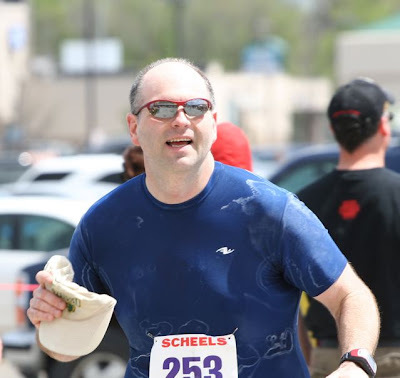 Around mile 19 I saw the 4:10 pacer go past me and that picked my spirits up a little bit. I continued my off again, on again running through miles 20 and 21. I wasn’t dead but I was starting to feel the fatigue. It was then that I felt a horrible twinge in my hamstrings. Uh oh. Cramps coming. I dropped down to a walk and stretched through it until it felt better. Thankfully no full out cramps. I continued to run and walk to manage my hammys. I was feeling a little bit down that I was not making my goals. I thought I was doing really bad when the 4:20 pacer met up with me around mile 23. Again, that lifted me up because I thought I was doing worse than that. I knew I would get a PR at least. By now the winds had picked up to gusting over 30 mph. I was still slowed by fatigue and now another potential cramp in my left calf. I slugged along at about an 11:30 average pace. The finish . . well . . this race finished INSIDE a large dome. Amazing, by the way. But as I was putting it all in at the end going down the ramp into the dome there went my hamstring for good. I didn’t want to finish this way. I had to drop to a walk and hobble down the tunnel. 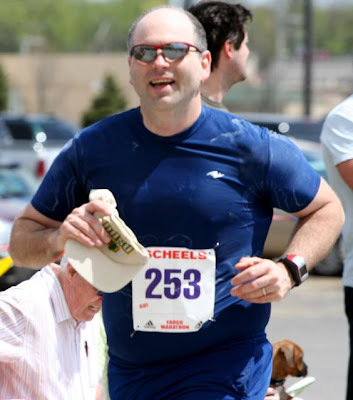 Fortunately it stretched just enough that I could pick it back up and finish strong as I entered the arena. I headed to the medical tent for an ice pack and now it’s feeling pretty good. So, overall I wish I was feeling better and could enjoy the race more. The last half I was just so focussed on trying to get down the road that I didn’t really appreciate all the crowds around me. But definitely another one under the belt and I’ve learned some good lessons. 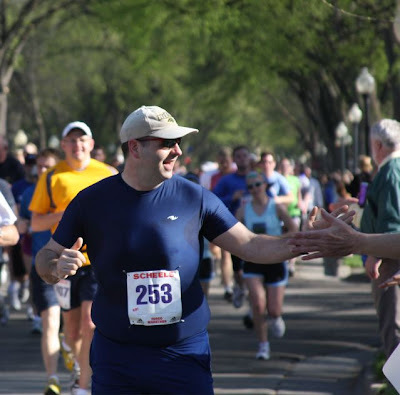 The weather was fantastic – – about 65=70 at the end of the race. Even the wind felt pretty nice in spots. 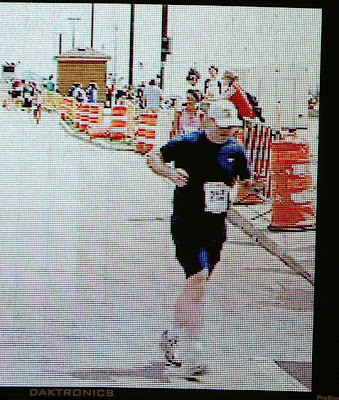 Here I am just after mile 4 on 8th Street. I’m still looking pretty fresh. That’s my boy, cheering me on. Coming into the finish. Look what 4.5 hours of sweating will do to you! This is me on the Jumbotron in the dome. I was just entering the tunnel and this is where my hamstring started pounding and quivering. Carbs are the fuel of choice for any long distance runner and tonight was no exception for me. It’s time to carb load. Of course it really takes much more than one meal the night before a race. 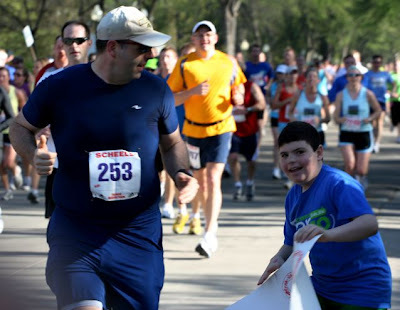 It takes months of slow long runs to get your muscles trained to store more glycogen. Glycogen is what your muscles burn and when they run out of glycogen and stop moving that is what we call ‘hitting the wall’. I don’t plan to hit any walls tomorrow. I plan to finish my marathon in about four hours. This linguini with a mushroom tomato sauce will certainly help me along the way. Only a few more days before the marathon and I feel ready. I was just lamenting over on the runningahead forums that I both love and hate tapering for these races. I love the taper time as I feel so strong when my legs are well rested. Like this morning when I went out for a very strong and invigorating 4 miles. But I hate the feeling that I am slacking off. After these months of training and long runs I just want to get out there and run some more. I also start to feel bloated and heavy. 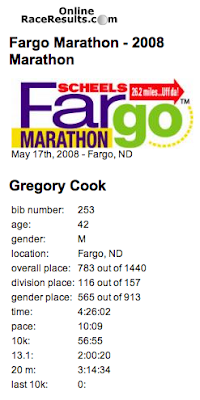 Oh, speaking of that, I did not meet my weight loss goal for the race. I was hoping to be about 30 pounds lighter. But that’s the way it goes. I can never seem to lose weight near the end of my training. As a matter of fact I tend to gain weight. So there it is. I’ll make the best of it this Saturday. I am really looking forward to a good strong race in my hometown. First the run. Today was AWESOME. The temperature was in the mid 30’s and it was sunny, sunny, sunny. Perfect for me. I headed out hoping to do 10 miles but I was just feeling great so I did 12 miles in all. I was even able to maintain a good 8:40 pace even at the end of my run, so I was happy. There were a lot of runners out and about this morning. I think there was some kind of organized marathon training run as I saw lots of people on the marathon route and an aid station set up. Now the rant. Garmin and motionbased are beginning to really piss me off. 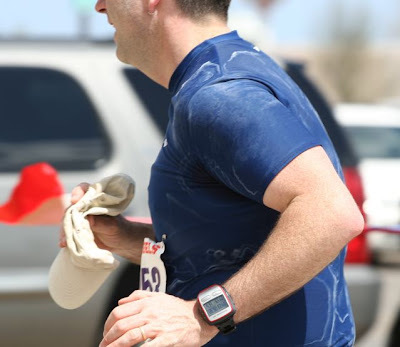 I have used motionbased.com for a couple of years to log my runs from my Garmin forerunner 305. It’s taken a long time for Macintosh compatibility to come from Garmin. Toward the end of this month motionbased will cease and everything will be migrated over to Garmin Connect. GC is a brand new logging system built from the ground up by Garmin. Although they should support all Garmin devices, none of their information pages, nor the garmin connect web site says anything about Garmin devices other than the Edge 605/705 and Forerunner 405. I’m not sure yet what will happen when I try to upload from my 305. As of today it is not possible to use Garmin Connect with the 305.